We are glad to announce the new curriculum Data Science at our university starting most likely at the winter semester 2018/19. The following structure, which was decided upon by the study commission, can be found below. Yet the exact courses are not final yet. Therefore this post does not show the final version of the courses. Yet we are confident this will be more or less the way it will look like in the future. If any delays should occur it is still possible to complete all listed courses while being enrolled in any computer science master (TU Wien). Regarding any question about admission please contact christoph.neuherz@tuwien.ac.at. 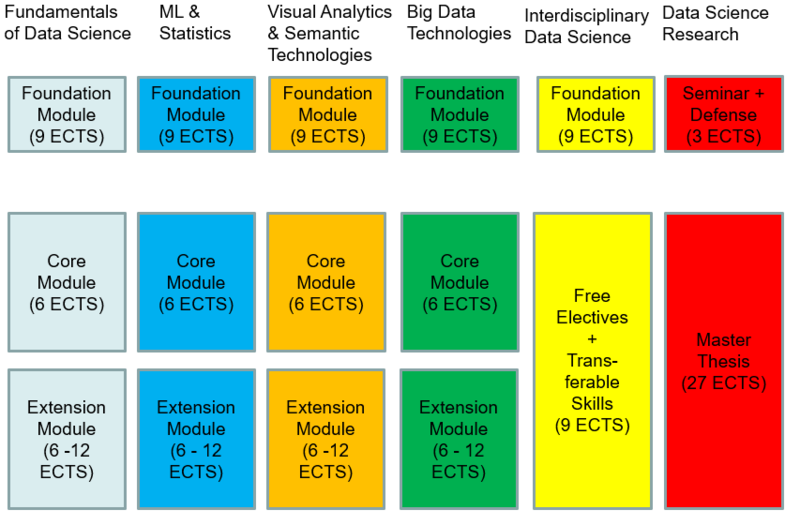 Mandatory-Part: All foundation modules, the „Data Science Research“ track, as well as the „Interdisciplinary Data Science“ track (containing free electives + Transferable Skills). Core Modules contain 6 ECTS (no choosing) in comparison to Extention Modules which contain more than 12 ECTS which you can choose from. Important: You have to complete the related core module at the end of your study, if you choose to complete an extension module of the same track (e.g. Enterpise Engineering). They are not meant as a „gate keeper“. You can find the preliminary courses of the foundation-, core- and extension modules below. Du findest den datenschutzrechtlichen Hinweis betreffend unserer Mailadresse im Impressum. Die Fachschaft Wirtschaftsinformatik und Data Science sucht ständig neue Mitglieder, die sich gerne für die Studierenden einsetzen und diese beraten wollen. Außerdem brauchen wir immer Leute, die uns beim organisieren von unseren Events helfen. Wenn Du gerne feierst und viele neue nette Leute kennen willst, bist Du bei uns richtig! Wie sehr Du dich bei der Fachschaft engagierst und welche Tätigkeiten Du übernimmst, entscheidest Du selbst. Komm doch einfach einmal während den Öffnungszeiten oder einem unserer Treffen vorbei und informiere dich über deine Möglichkeiten. Impressum. Powered by WordPress and Maxwell.